This is the final part of my series on hedging currency risk (click for Part 1, Part 2, Part 3). I was originally only going to do three parts which consisted of the experiment in currency hedging, but decided to do one final piece to go through how I decide on whether I want to hedge or not. If you want super smooth investing returns then you may always want to hedge, or if you simply want to minimise your risk. After all FX is difficult to forecast (correctly) and in the short term it could go anywhere. Even if you hold a stock for a couple of years, thats quite a short time frame for currency movements and anything can happen. But personally I like to try and be a bit smarter, I don’t automatically hedge but instead like to view where the exchange rate is compared to its long term movements and decide whether I want to take on the risk or not. 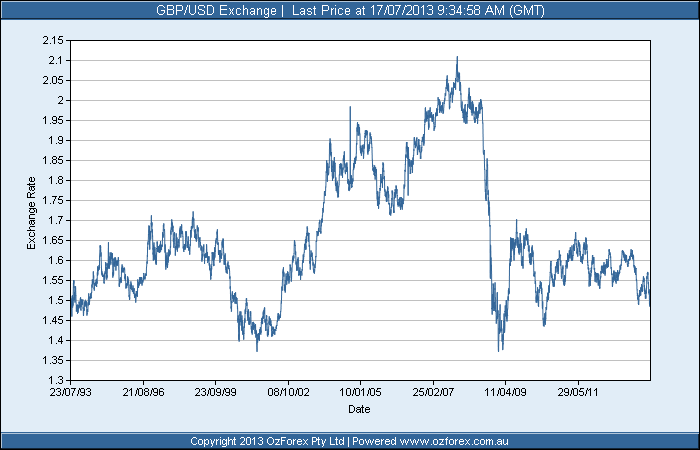 Let’s take a look at the historical chart for the GBPUSD exchange rate as an example. It doesn’t take a genius to see that we are currently nearly the 20 year lows for the exchange rate. That means pounds are cheap and dollars are expensive on a historical basis. So just based on this chart, if I have dollars today, do I want to hedge (i.e. go long GBPUSD?). The answer is clearly, yes I do. We’re at 1.5 and history suggests I have an upside to maybe 1.4 on my dollar holdings. But I have a downside up to 2.1. If the exchange rate goes anywhere near 2 in the next few years I will see a dramatic decrease in the value of my US holdings (in GBP terms). So hedging is a good idea. I know I have a lot of US readers so conversely, if I was in the US and investing in GBP denominated assets I would probably not hedge, as there appears to be more chance of my holdings increasing in value in USD terms than decreasing. Of course, as a value investor, I know better than inferring things just from charts. Predicting future movements from charts is a mugs game, but note here I am not predicting. All I am doing is assessing the risks and deciding whether that is a risk I want to bear or not. By holding US stocks in my UK account I am effectively short GBPUSD. I don’t have any choice about that now. What I have to choose is whether or not I want to hedge that risk and the chart suggests eliminating that risk is in my best interests. But what else do I need to think about? Well I think of three main things as effecting exchange rates. I am far from an expert in this, but a brief understanding is all you need when deciding whether to hedge or not. Firstly on monetary policy, which I use to mean money printing and interest rates. If one country is printing more money than the other, this leads to higher inflation and as a result the FX rate will move to devalue the currency. Also if one country has higher interest rates than another then it is more advantageous for investors to be in the currency paying higher interest rates, so it appreciates in value. Secondly on government accounts, this is more of a subtle effect. If debt is high and growth is low then it is the anticipation of inflation in future years that moves the exchange rate, as the expectation is that governments will have to increase inflation to reduce the debt. So if you have a huge debt, your currency will be valued lower. The third is the trade deficit. If a country has a trade deficit then it is buying more than it sells, i.e. it requires more foreign currency than it gets back in sales. So the demand for foreign currency is higher hence the domestic currency will depreciate. Looking at the three areas above, the UK and US are actually quite similar. Both have record low interest rates, relaxed monetary policy and big government debts and deficits. I can’t see any clear indication of where the currency will head in the future, but the chart is enough to persuade me to hedge my USD holdings. This same process can be done with any foreign currency you invest in. Just look at the historical chart (not just 5 years, the longer the better, at least 20 I say) and see if you are more likely to gain or lose money from FX movements based on the past. If in doubt, put on the hedge, after all you are not making a bet here, you are simply deciding whether you want to accept the risk or not. Don’t try and second guess short term movements, but be sensible in the risks you expose yourself to. added I receive 4 emails wiith the exact same comment. If you visit this page you can unsubscribe from the comment emails.